Lavandula Vera is synonymous with Lavandula Officinalisz. This term officinalis was once used to designate the plant as the one used for medicinal purposes. This Lavender is now known as Lavandula angustifolia Vera. These plants have spread across the world growing on different continents producing a large range of flower colors due their cross pollination with each other. 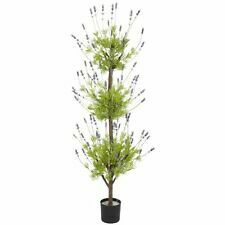 Vera is a compact Lavender plant with excellent winter cold hardiness tolerant of zone 5. The flowers are sweet, highly fragrant and produced abundantly in early summer. The flower color is a medium blue and the foliage is green. Plant height is 36-48 inches due to the long 18-20 inch flower stems. Space plants 48 inches apart. Hardy zones are 5-9. Learn more about Lavandula angustifolia English Lavender.